This manual gives you a walk-through on how to integrate services into JChem For Excel. The integration of Marvin services clients into JChem For Excel is currently incomplete. As local services can't be accessed in non-Java environments, they don't work in JChem For Excel. However. web services do work. 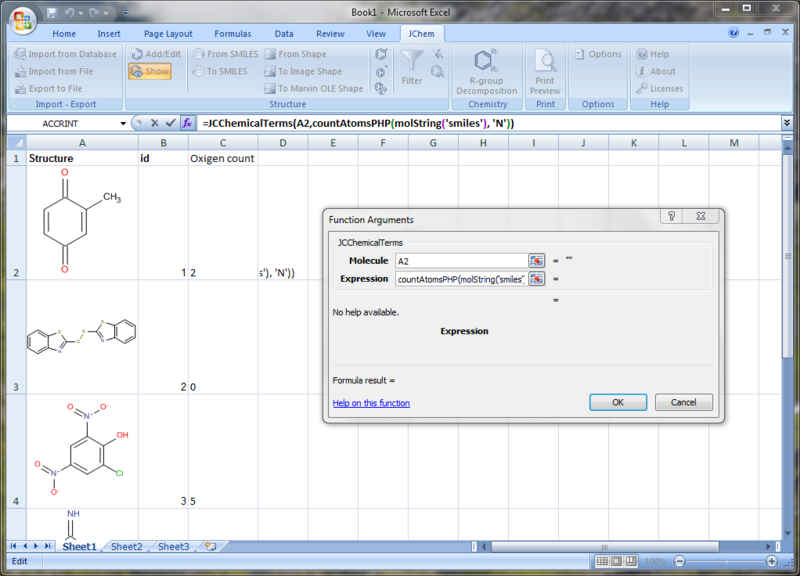 To call a service function via Chemical Terms, use the JCChemicalTerms Excel function. In this example we want to calculate the number of N atoms in the SMILES string of the molecule. We use the JCChemicalTerms(A2, CountAtomsPHP(molString('smiles'), 'N')). The result of the calculation is put into a new cell. The content of the cell will be automatically updated if the values of the input cells are modified.